(已歇業) 花酒藏海鮮吧是台北信義區 ATT 4 Fun 餐廳之一, 也在台北南山微風和信義華納威秀附近的餐廳名單內. 這次有這個榮幸可品嚐到花酒藏雙人海鮮套餐. 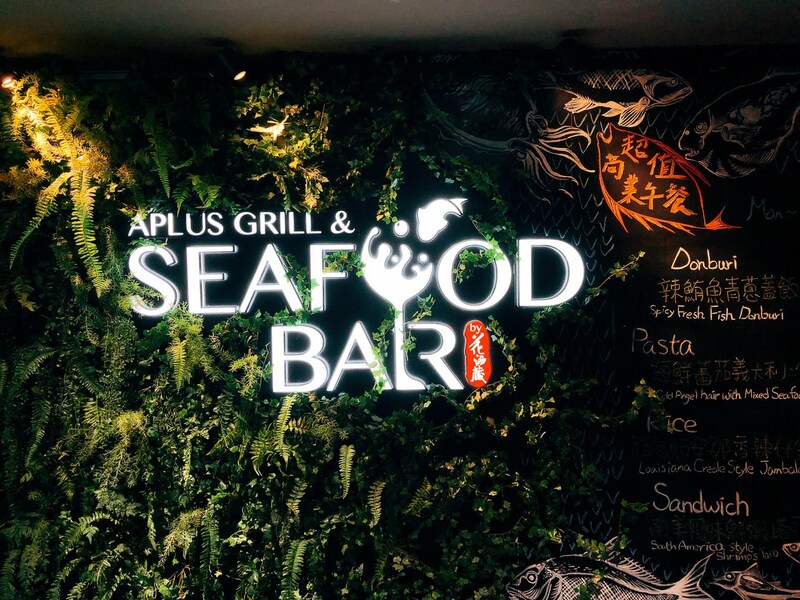 (Closed Down) Aplus Grill & Seafood Bar is one of the ATT4Fun Restaurants. 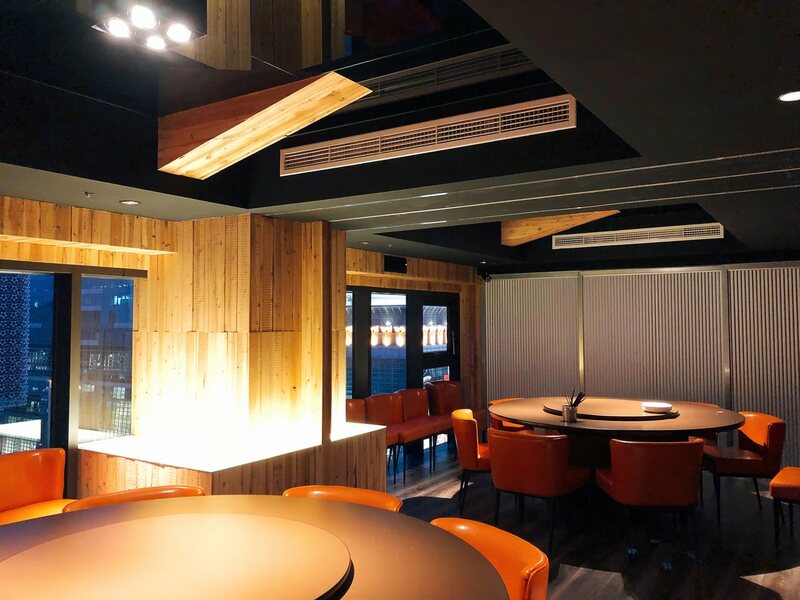 It is also the restaurant near Xinyi Viewshow theater and Nangshan Breeze Center. I have the opportunity to try their cuisines. 搭電梯抵達 ATT 4 Fun 九樓後, 即可看到“撈王”與“花酒藏海鮮吧”餐廳, 黑板上寫著花酒藏商業午餐選擇, 踏著沙灘海浪動態投影地板, 入座窗邊座位時, 即可看到 101購物中心夜景, 四處走走時, 隨後發現有可愛獨角獸游泳圈裝飾, 處處充滿驚喜與年輕的設計概念. 大包廂則是可隔開成為小包廂, 相當適合公司部門聚餐. 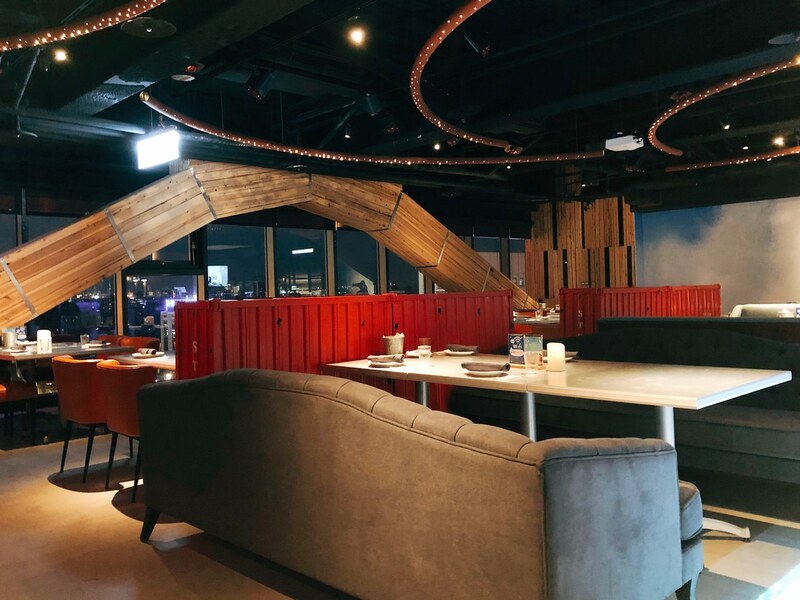 When arriving ATT 4 Fun 9th Floor, you can see the Aplus Grill & Seafood Bar and “Laowang Restaurant”. 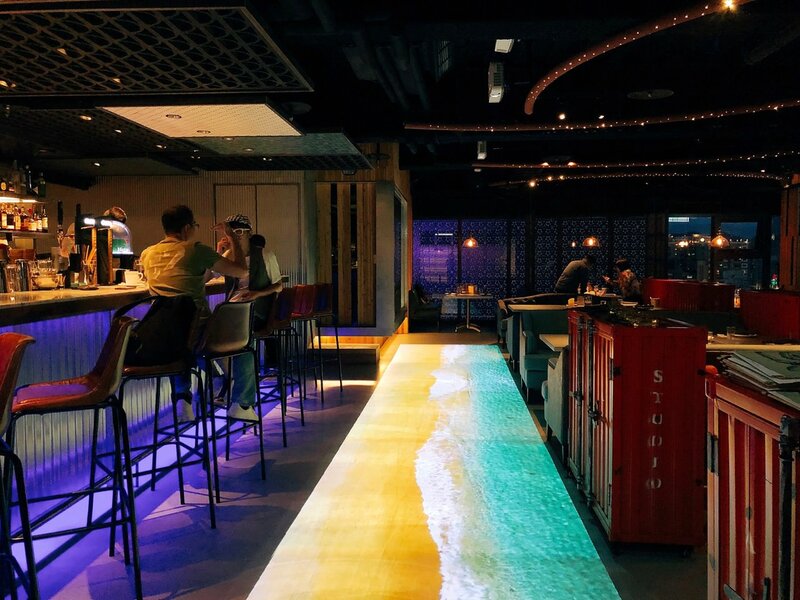 It was fun to walking on the beach and wave projector floor inside the restaurant. 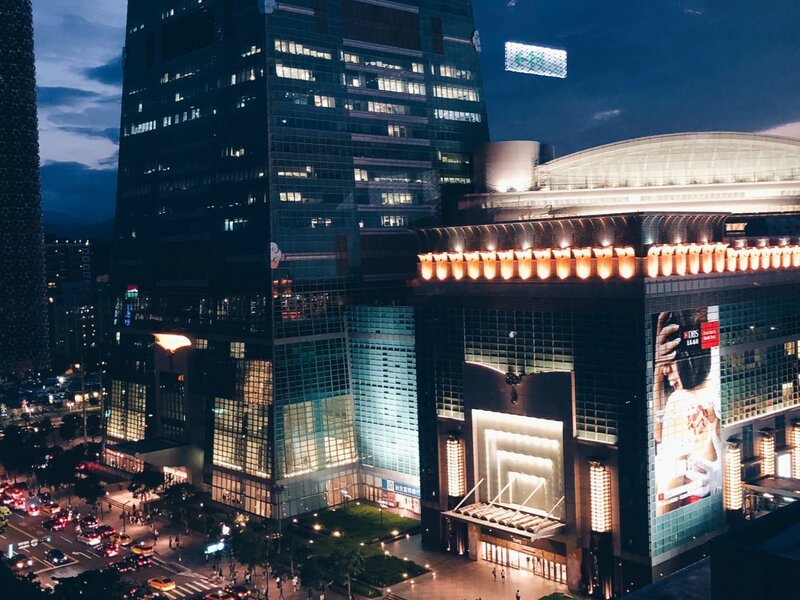 We are seated by the window, which I can see the 101 Shopping Mall. 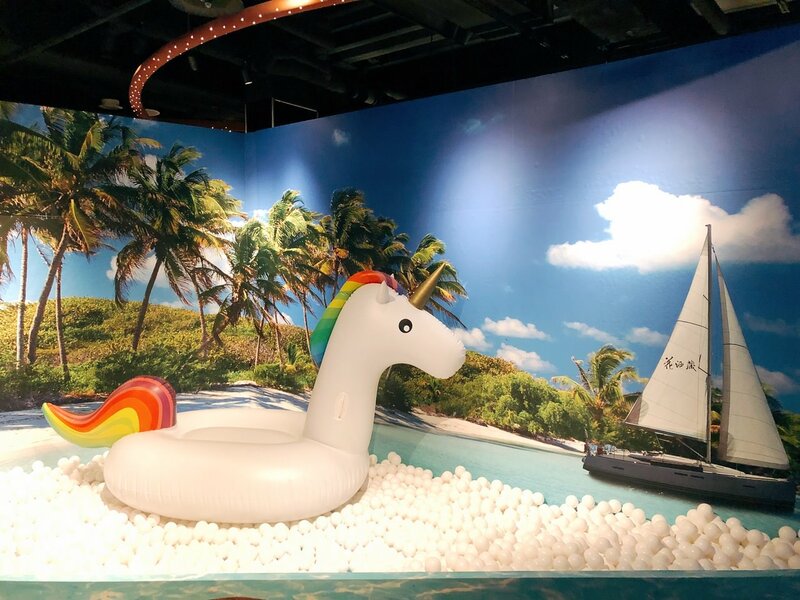 The indoor design is full of young and surprising themes, including the cute unicorn swim ring. The large private room can be separated into small dining room. It is suitable for department staff lunch/dinner. 精緻海鮮盤有分原味與紐奧良口味. 紐奧良口味是海鮮灑上類似紅色七味粉調味, 因此會有辛香風味. 我跟朋友決定選原味,海鮮盤一端上桌, 生蠔與蟹膏螃蟹最為搶眼. 生蠔部份是可選廣島生蠔或是大西洋生蠔, 差別在於大西洋生蠔具有較多海味, Size 較小, 因此會提供較多份量. 廣島生蠔則是較多奶味且Size 大. 我跟朋友是選擇廣島生蠔, 視覺上沒有像 “英國生蠔海鮮小屋”的英國生蠔鼓起, 擠上幾滴檸檬汁, 迅速將新鮮生蠔咻一下入口, 多汁程度高且反而是海洋鹹味較多, 相比之下,我在 “香頌私宅” 吃到的酥炸廣島生蠔黯然失色, 單點生蠔也是不錯的選擇. 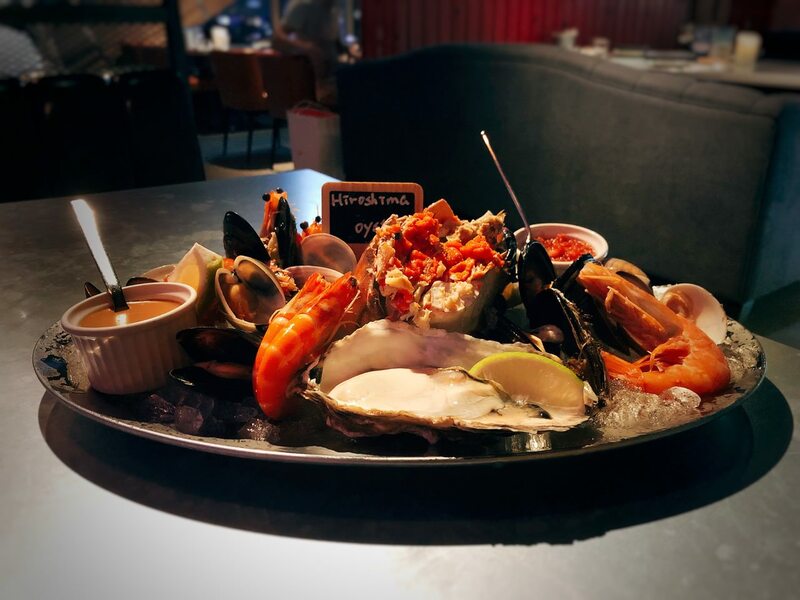 The Classic Seafood Platter has original flavor and New Orleans Flavor. The New Orleans flavor means the seafood will be coated with spicy powder. My friend and I chose the original flavor. 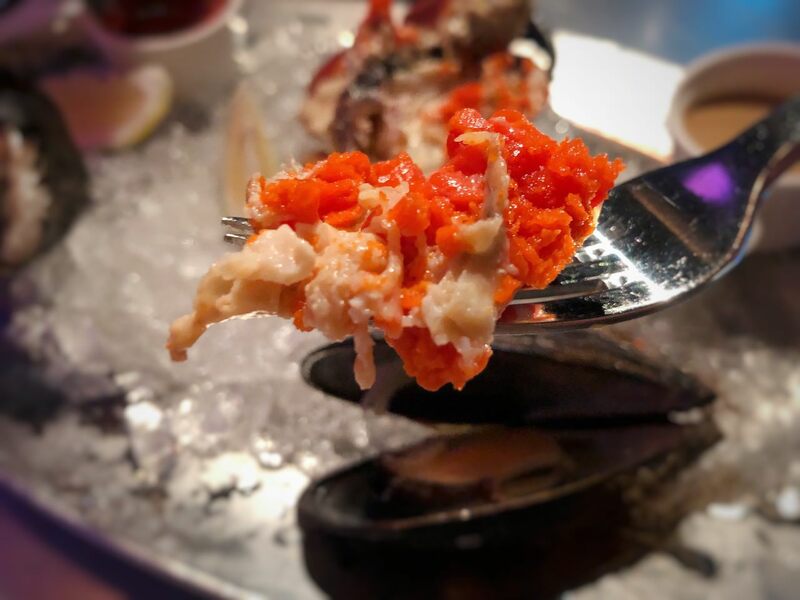 The Oysters and Crab with crab butter leave amazing impression. 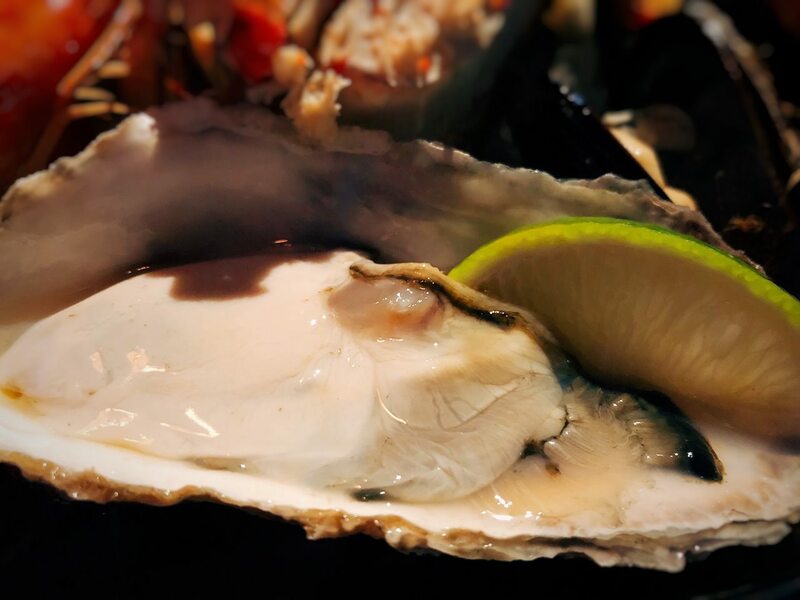 There are two options of oysters – Hiroshima or Atlantic. The difference is that Atlantic oyster is smaller but will be provided with more quantity. The Hiroshima oyster has creamy taste. My friend and I selected Hiroshima Oyster. The visual impression is not as large as “Taipei British Oysters Shed”. After squeezing the lemon, I immediately eat the oyster without any hesitation. It is very juicy but with more ocean aroma. 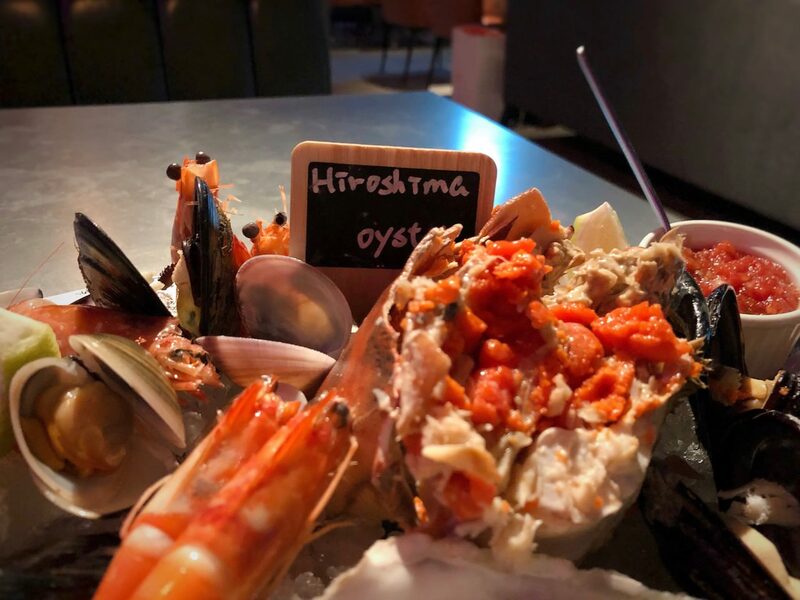 I prefer the raw oyster than the fried Hiroshima oyster that I tasted at “Chanson Bistro”. 來自愛爾蘭的爆膏帝王蟹是這款精緻海鮮盤的主角, 鮮橘紅蟹膏滿到殼外, 我跟朋友分別用叉子挖起濃郁海味的綿密蟹膏, 第一口帶給味蕾充分的滿足, 第二口帶給舌尖纏綿的口感, 到了第三口時, 終於意識到還剩相當多蟹膏, 所以我會建議吃一小部分蟹膏後, 喝個水先吃其他海鮮. 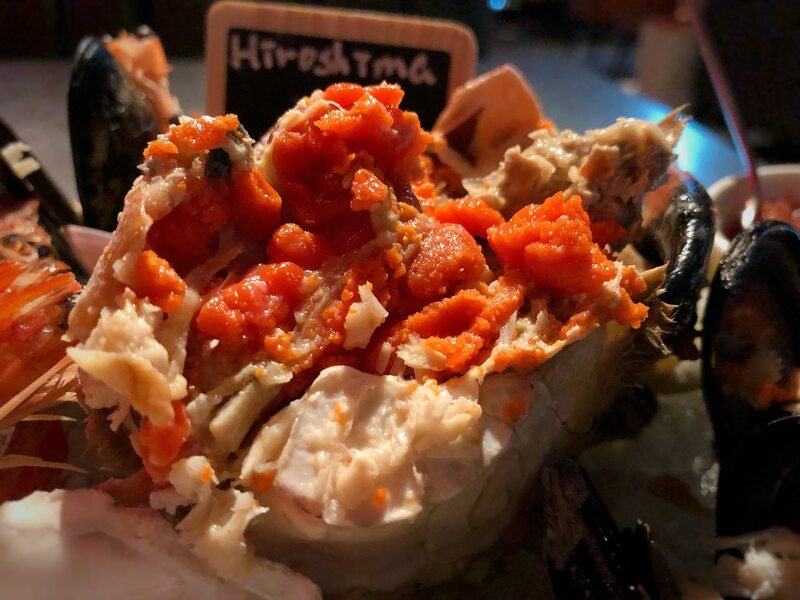 This Ireland crab has large amount of orange-red crab butters, which is unexpected. I scooped the crab butter and tasted it. 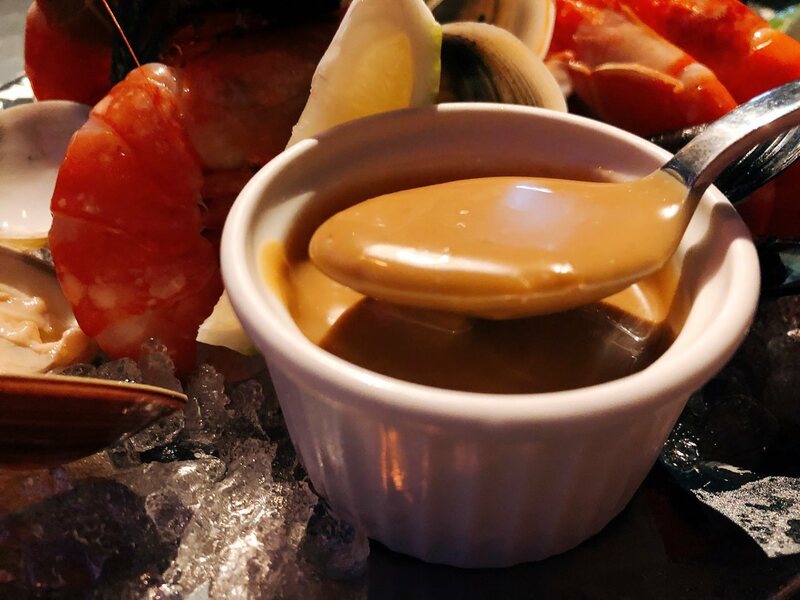 First impression is full of seafood aroma. The tongue are surrounded by the creamy taste. There are way too much crab butter to eat it all at once. I would suggest to eat small amount of crab butter first, then drink the water. You could taste other seafoods in case the crab butter leaves too much creamy taste on your tastebuds. 大 Size 的天使生紅蝦脫殼容易, 吃起來鮮甜, 若覺得太平淡, 可加墨西哥莎莎醬增加辛香味. 淺褐色芥末美乃滋醬意外地帶來如同吃日本料理的感覺, 淡菜視覺上不及 “小後苑 Backyard Jr.” 如此地飽滿, 我會建議加芥末美乃滋醬到熟白蝦和淡菜. 整體吃下來雖然沒有生猛海鮮的感覺, 但光是蟹膏, 就足以打敗多數海鮮餐廳. 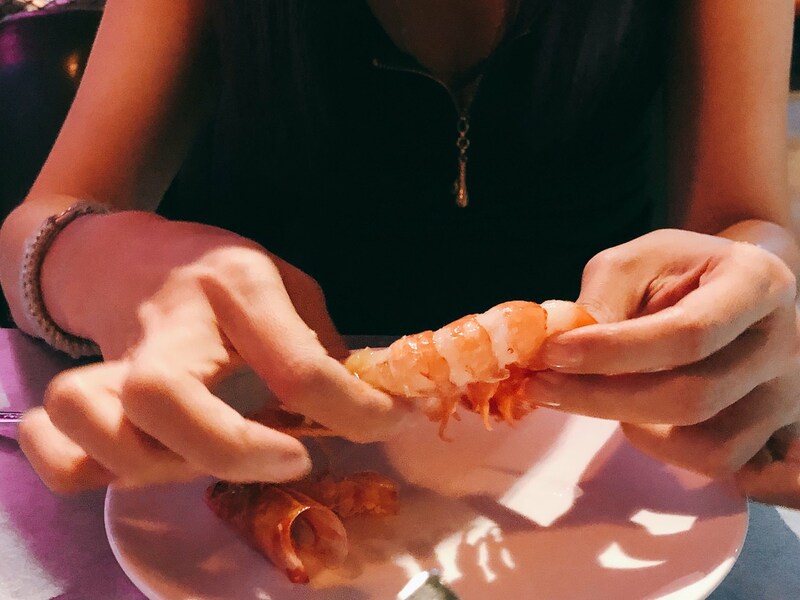 The large raw shrimp is easy to peel off. It is very fresh. But, you think the flavor is too simply, you can add the Mexican Salsa Red Sauce to add spicy flavor. 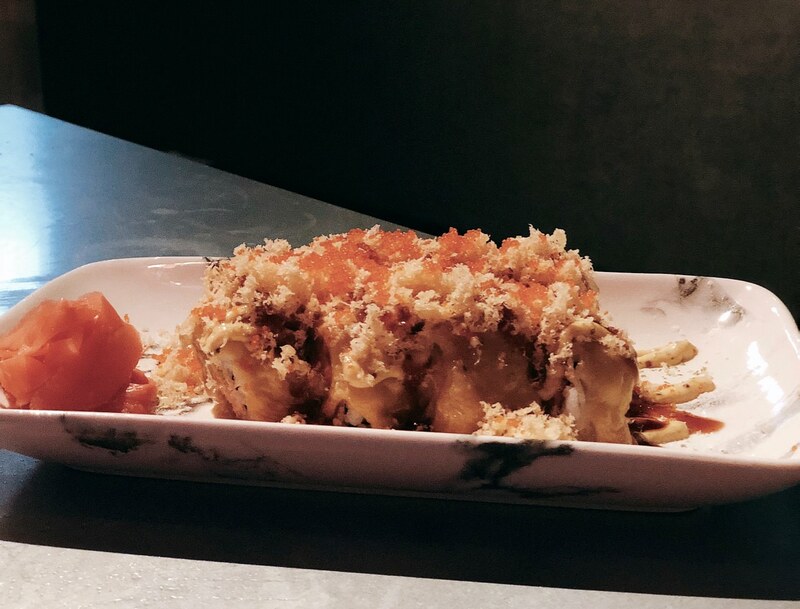 The light brown mustard mayo offer different type of spicy flavor like you eat at the Japanese cuisine. 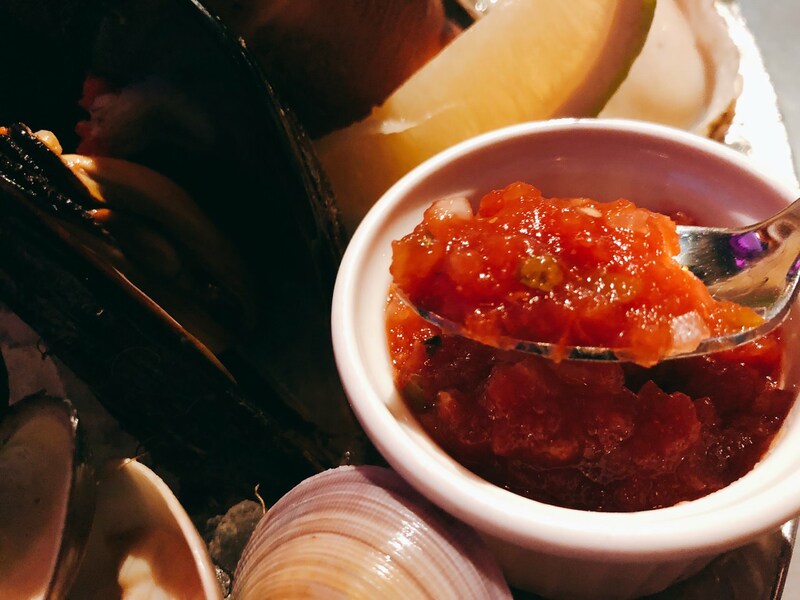 The mussels are not as large and juicy as “Backyard Restaurant”. I would suggest to add the mustard mayo sauce to the mussel and the white cooked shrimp. Overall, this seafood platter has less seafood flavor as expected. But with the large amount of crab butter, it already left quite an amazing impression. 一道開胃菜兩人分享. 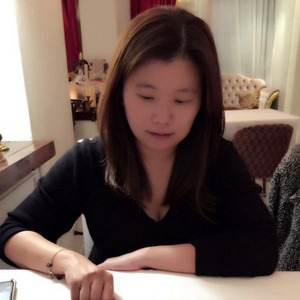 原本以為是廚房先準備好凱撒沙拉, 但是店員端上一盤設計感十足的沙拉,半熟蛋在乾冰裝飾下如浮雲般, 花酒藏海鮮吧採用桌邊服務. 店員先熟練地將起司刨成雪花般, 再將乾冰中的半熟蛋小心地打開落在沙拉上, 半熟蛋形狀就跟在 “L’origine 歐傑洛義式餐廳”吃到的半熟蛋一樣完美, 少量鹹味小鯷魚刺激味蕾, 很可惜沙拉碗較小, 攪拌起來有點麻煩. 雖然只是個沙拉配菜, 店家精心準備與設計讓人佩服. Two people share this Appetizer. I thought that this dish is just simple and prepared at the Kitchen before serving. 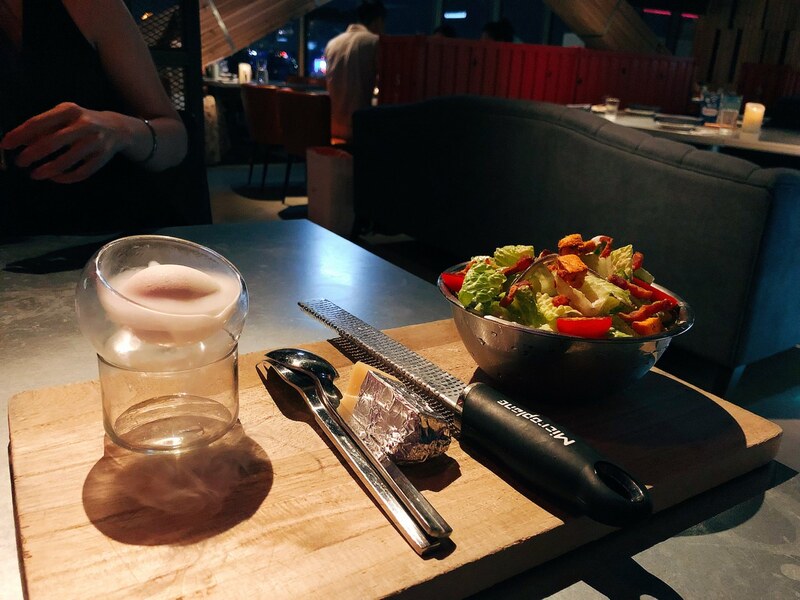 But, the staff carried a plate with salad bowl, egg and cheese for table service. 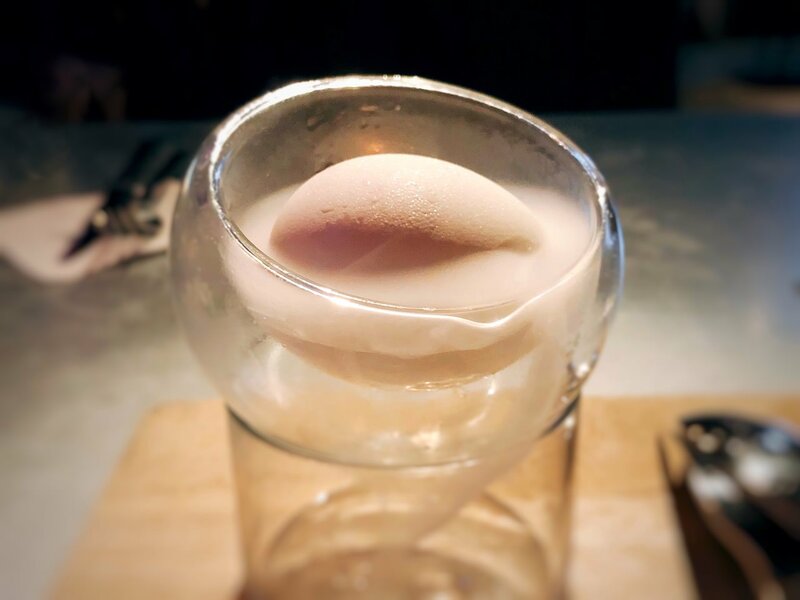 The onsen egg is decorated with dry ice. 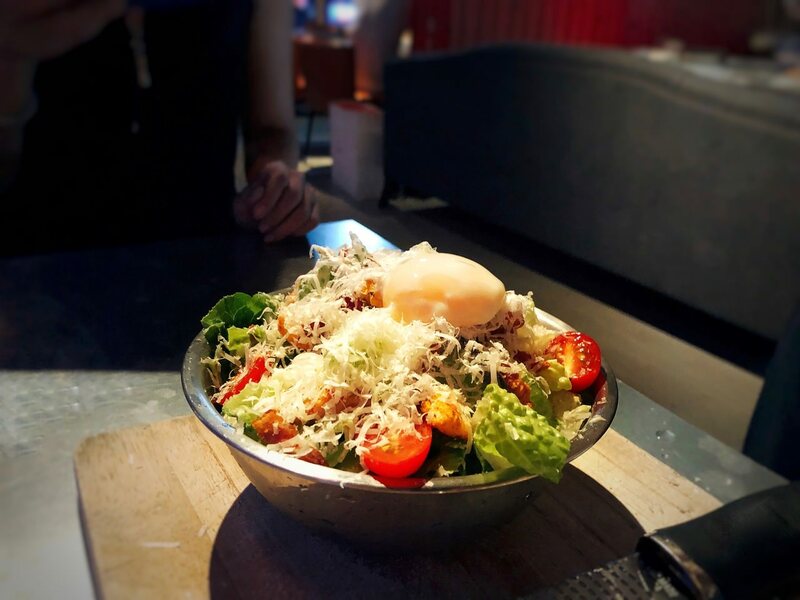 Aplus Grill & Seafood Bar staff shredded the cheese and open the onsen tamago egg on the salad. 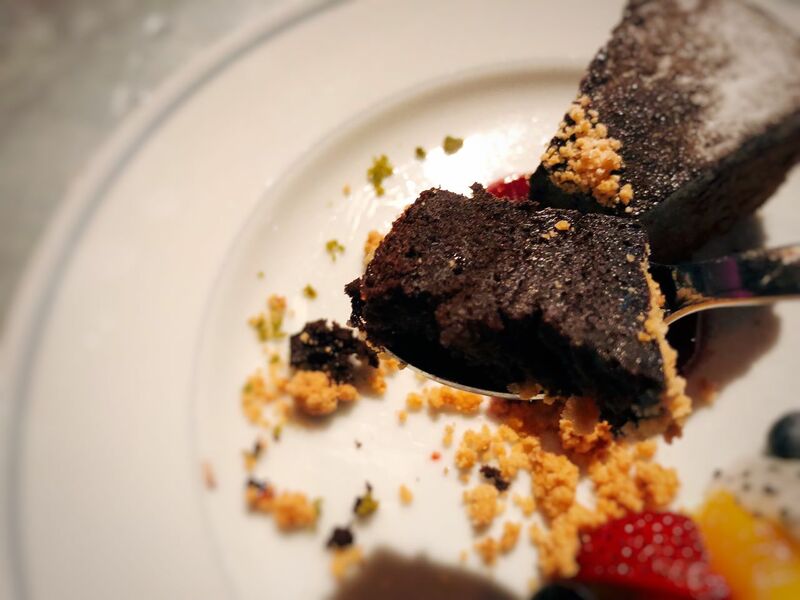 The shape is as perfect as the one that I ate at “L’origine Restaurant”. The small anchovy brings hints of salty taste to stimulate the tastebuds. 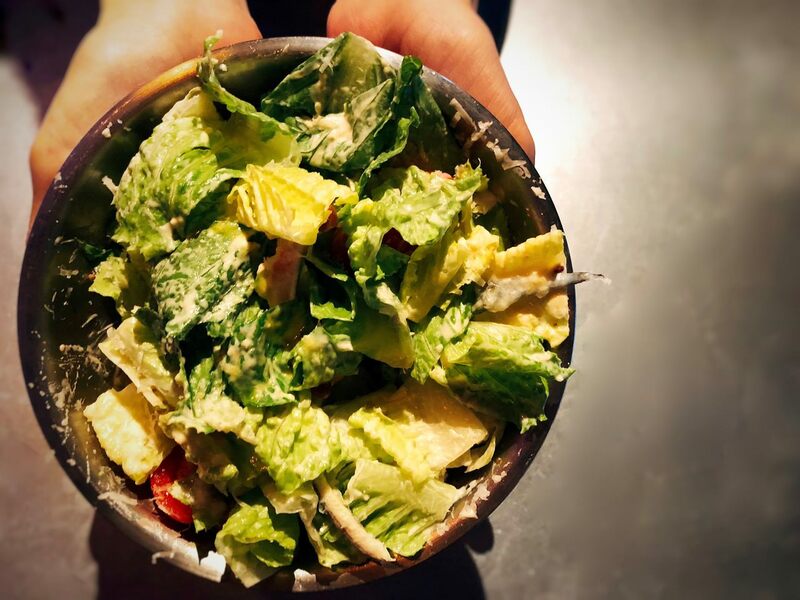 However, the salad bowl is small and it is a bit difficult to mix all the ingredients. 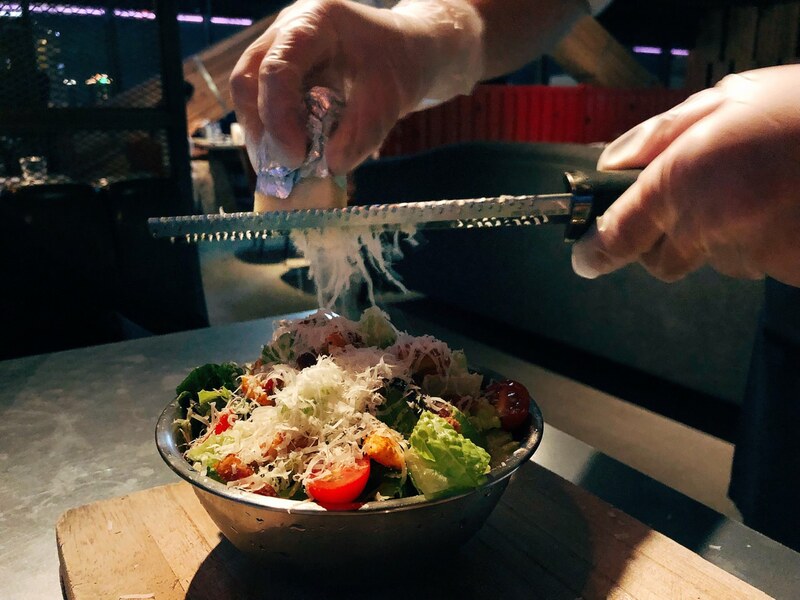 Even though it is just a salad, they are still willing to prepare the this dish. 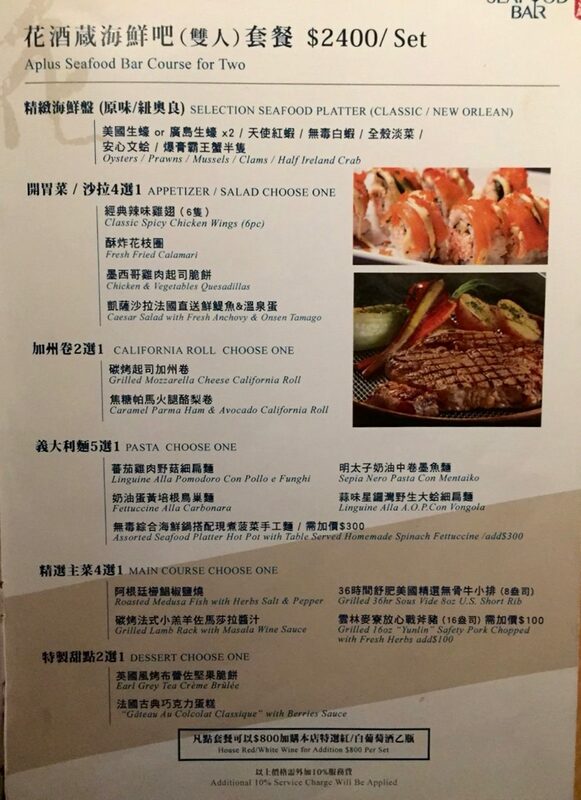 我上次吃加州捲是在美國加州的 “Makino Sushi and Seafood Buffet”, 碳烤起司加州捲的外觀有著類似 “金子半之助”的天婦羅麵衣, 品嚐時才發現只是酥炸麵衣灑在加州壽司上, 風味因為起司而稍微過鹹, 口感則是因為美乃滋而變得軟爛, 把原本應該是麵衣碎末的酥脆口感蓋住, 這是較為可惜的地方. Last time I ate the California Roll would be at “Makino Sushi and Seafood Buffet”. 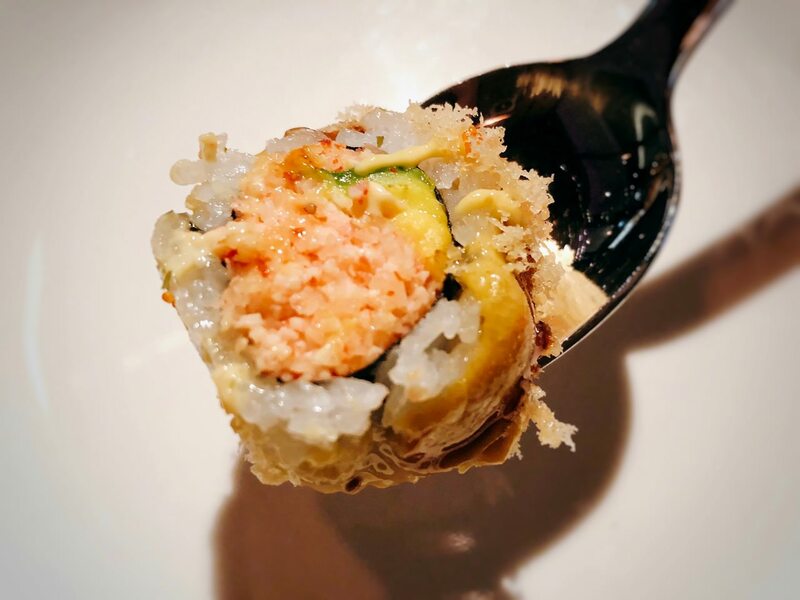 The grilled California roll appearance is similar with “Tendo-JP restaurant” tempura coating. While tasting, I realized that it is just crispy coating spreaded on the surface. The flavor is a bit overly salty because of the cheese. The taste is bland and mushy because of the mayo sauce. 兩人共享這道明太子奶油中卷墨魚麵, 粉白色中卷圈環繞著暗黑墨魚義大利麵, 花酒藏海鮮吧廚師將少許紅色辣椒絲作為裝飾也做提味, 讓這道菜餚不會過膩, 綿密奶油醬附著在義大利麵上, 入口即刻有明太子顆粒口感, 墨魚麵並不會讓牙齒變黑, 女生們可以安心享用, 我會推薦給喜愛日式義大利麵的人. 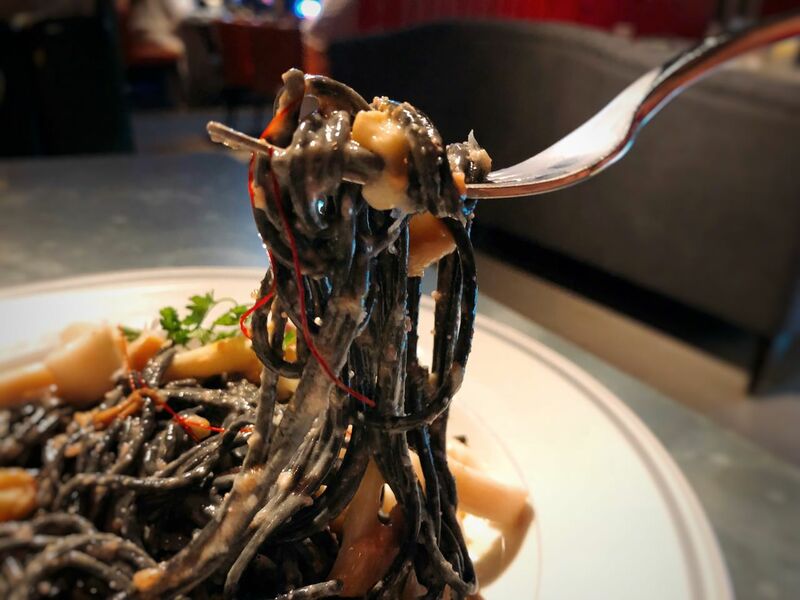 Two people share this pasta dish. 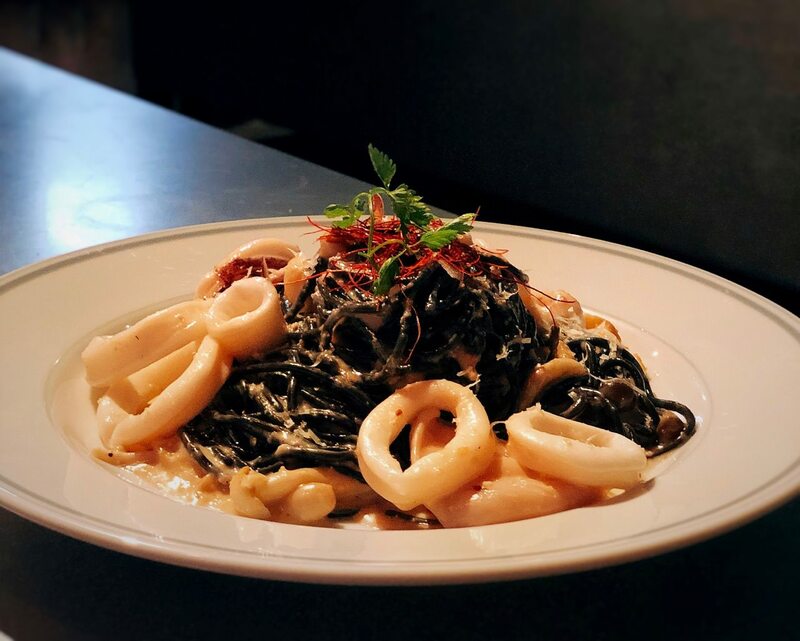 The squid rings surrounded the black squid pasta. The Aplus Grill and Seafood chef put a bit of red pepper shred on the top for decoration and add more spicy flavor. While eating the pasta, the tastebuds would sense the roe mixed in the creamy sauce. I would recommend this dish to people who like to eat Japanese Style Pasta. 這一道碳烤法式小羔羊佐馬莎拉醬汁是兩人分享, 餐廳告知羊排都是在 8oz 左右, 因此羊排數量是看羊排本身的大而定, 此外, 店家建議 4 ~ 5 分熟. 花酒藏的羊排顏色比 “al sorriso 義式餐廳”的羊排更鮮紅, 我原本以為小羔羊油脂少, 或許會比較難咬, 吃第一口時, 發現骨頭與肉容易分離, 口感也比想像中地嫩, 相當不錯, 配菜有綿密無香料的馬鈴薯, 紫紅色馬莎拉醬有著迷人甜味, 相當適合當肉類醬料, 間接找到甜與鹹的中間點, 菜單也有單點碳烤法式小羔羊佐馬莎拉醬汁 (NTD $680), 會推薦給喜歡吃羊排的人. Two people share this dish. 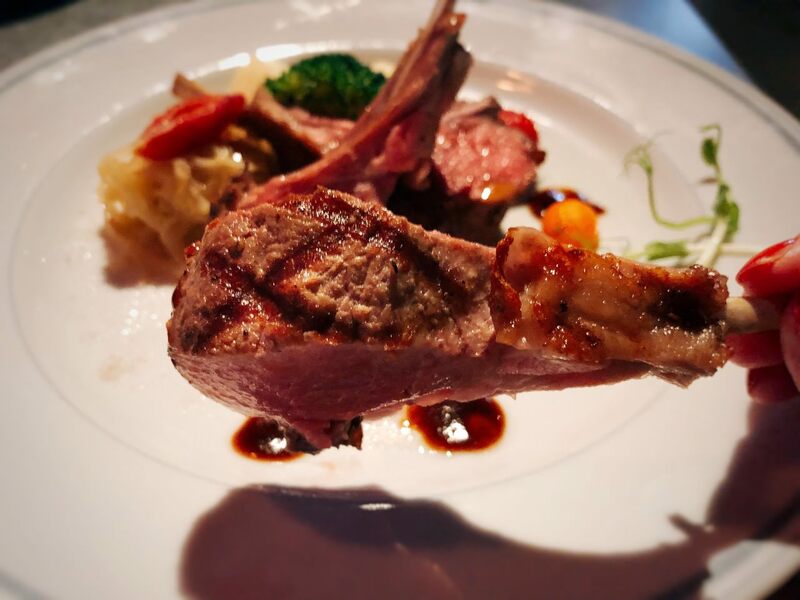 The staff mentioned that the lamb rack is about 8oz per dish. The quantity of the rack is based on its oz. Also, the chef recommended medium rare instead of well-down. 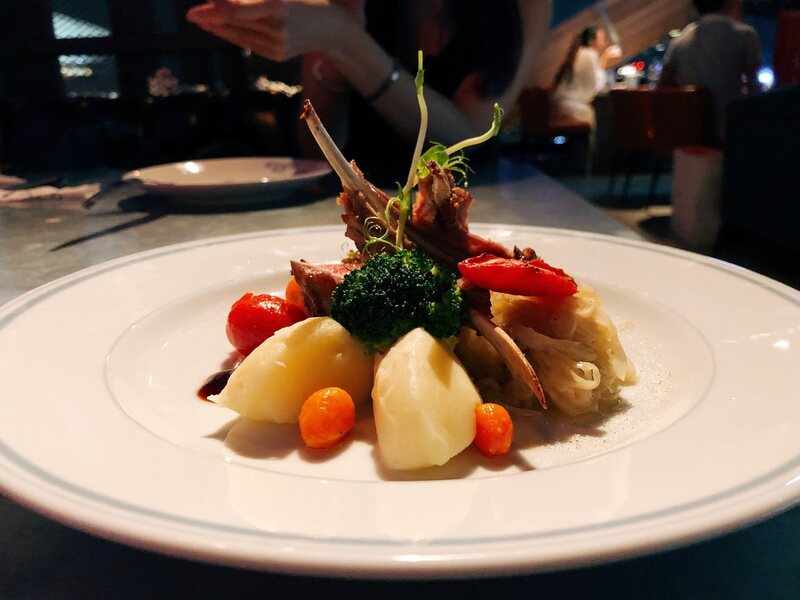 Aplus Grill and Seafood Bar’s lamb meat is quite red comparing with “al sorriso Italian Restaurant”. The lamb is much more tender and delicious than I expected. The potato has original starch flavor since there is no spices, which is perfect. The Marsala sauce is a bit sweet and perfect for meat sauce. It can balance the sweetness and salty. You can just order this single dish for NTD $680. 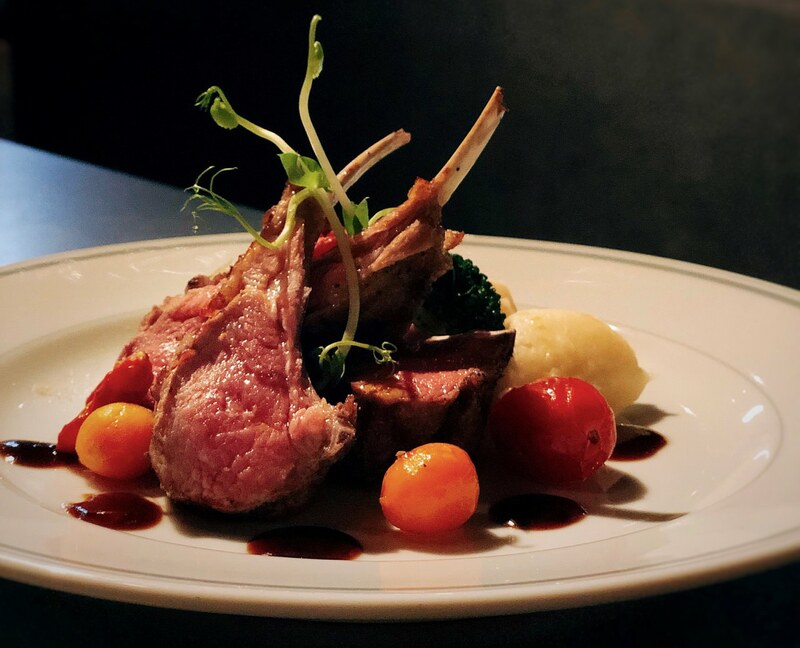 I would recommend to people who like to eat lamb. 這道雙人套餐只提供一份甜點兩人享用, 但是店家提供給我們兩份甜點體驗. 第一份甜點是英國風烤布蕾佐堅果脆餅, 淺褐色烤布蕾本身伯爵茶香不多, 一旁類似杏仁瓦片的脆餅口感極脆且有點厚度, 烘烤堅果香會讓人享霸佔一整片餅乾. 第二份甜點是法國古典巧克力蛋糕, 切小塊蛋糕時, 發現巧克力蛋糕體像巧克力布朗尼, 口感稍微乾, 但巧克力風味相當充足. The set only offers one dessert for 2 people to share. But, the restaurant offers us two desserts for us to try. 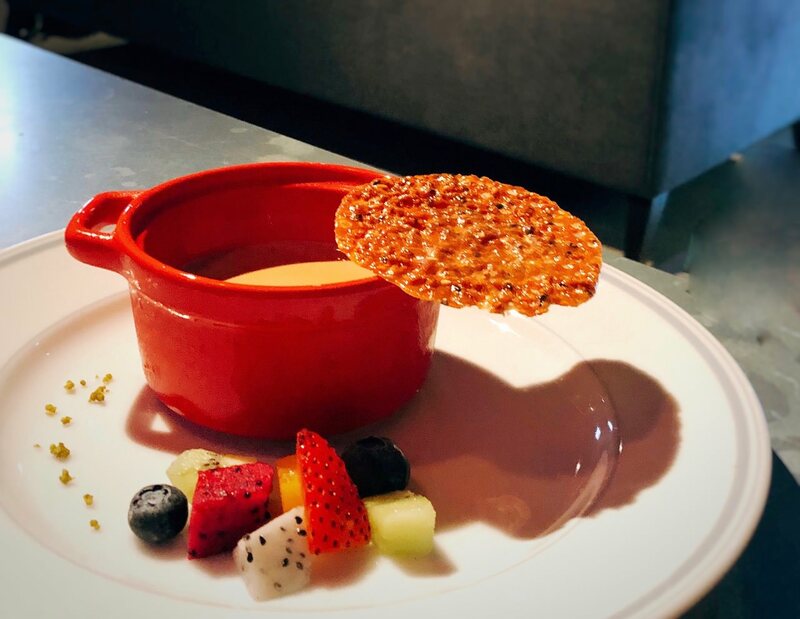 First dessert is Earl Grey Creme Brulee. The light brown color creme brûlée doesn’t have much Earl Grey British tea flavor. The cookie is crispy and tasty. 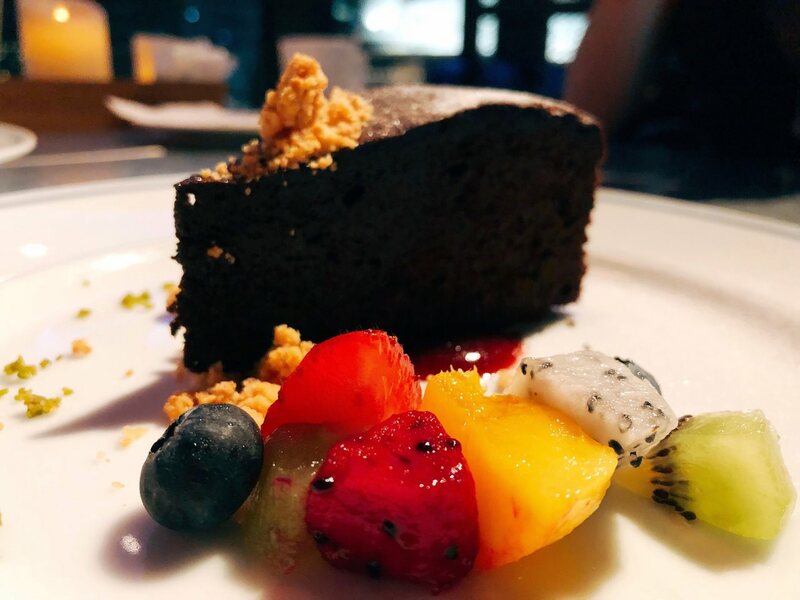 The second dessert is Chocolate cake, which tastes just like Brownie. It is a bit dry but full of Chocolate aroma and flavor.